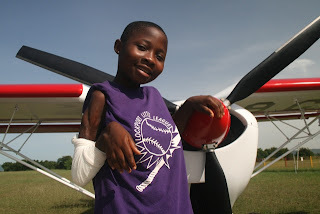 Lydia was one of our finalists in the Why I Want to Fly essay contest, and is a very special young lady living in Ghana. If her story and essay doesn't pull your heart string, I'm not sure what will. Compassion, motivation and the love of flight... Lydia has it all, including the smile. "My name is Lydia Westi I am fifteen years old am from Akatsi in the Volta Region of Ghana, I was born in Asesewa and I spent most of my childhood years in Agormenya. I had my primary education at Agormenya R/C Primary School. When school closes I help my mother at the market to sell clothes on market days. It has always been my dream to become a hair dresser in the future because there was not enough money in the house to send me to school after my basic education. So I settled on learning a trade after school to support myself. On one Wednesday which is a market day in Agormenya, I decided to help my mum in the market before leaving for school because that day was a very busy one. My mum reluctantly agreed this after a time of unyielding effort to convince me to go to school. Little did I know that, that day was the turning point of my life. A few minutes after I have finished cleaning up the store and prepared the place for business three people came to buy some items from the store. When the elderly one among them saw me he felt so sorry for me. When he inquired about what happened to me, my mother came in and explained to them, how the small wound I had on my right hand when I was a little girl, was left unattended to because every one thought it was just a small wound and it will heal on its own. This wound eventually became infected and the infection traveled to the upper part of my hand and ate badly into the bones. As little as I was, I always held my hand upwards in order to reduce the intensity of the pain which was too much for me to bear. But the wound healed leaving my arm bent upward. So my right hand was virtually not useful at all. Because of this I had many limitations I did everything with my only hand -the left hand. After Mr. Porter had listen to what led to my predicament, he took me into his house and offered to take care of me and now he is training me to become a pilot engineer. Mr. Porter gave me hope and assured me that, I can make it even without the right hand. He became my right hand that was disabled because he was always there for me." "Learning to fly has brought a lot of changes into my life. Learning to fly has changed my way of thinking it has also changed my perception about life and has given me the courage to face life. With the skills I have acquired in Aviation and Technology Academy with respect to flying, I want to help the less privilege in the rural communities with what I can do. Most of the roads that lead to the rural areas are very bad. This makes it very difficult for cars to use these roads. I want to fly to these areas to talk to them about the importance of educating their children and talk to them about how to keep their surroundings clean to prevent the spread of diseases such as malaria, cholera and many more. I want to fly to be able to assist the young people in the rural communities with educational materials and other materials that are not able to get to them because of the bad nature of their roads. With this knowledge people in the remote areas who might not have any health post can live a life that is free from preventable diseases. Furthermore I want to fly be able to promptly attend to emergencies. In emergency situations aircraft are always the best option because they are faster than cars. With the planes accident victims can be taken to the hospitals on time to be treated. Also it can also be used as a means to rescue people who might be stranded in one way or the other. Again in my country, a lot of girls are not into aviation therefore I will also want to fly to encourage the young girls to go into aviation and to prove to them that aviation is not only for men but women can also go into aviation. In times of floods I can use the aircraft to send food and other materials to those who might be affected by the water to keep them alive and safe. I want to fly be able to visit a lot of countries and visit many places which have would have impossible without an aircraft. I want to fly to help reduce the rate of unemployment in my country. When you are airborne you are able to have a proper view of the earth below with advantage I would be able to discover new agricultural lands that will be suitable for planting. This will go along way to create jobs for the people that will be working on the land. Also with my condition I want to fly to serve as an inspiration to everyone especially those who might be disabled in one way or the other and make them understand that disability is not inability. You can always achieve whatever you want to achieve in life if you put your mind to it." Medicine On the Move has shared Lydia's story and her pending surgery. Please click Here to read more about this amazing young lady's life and her pending surgery. Lydia, I wish you continued strength and courage, and the ability to always smile. Jonathan Porter, you're doing good work down there. I wish Lydia the best of luck with her surgery and her future in aviation. She sounds like a truly remarkable young lady who will do wonderful things with her life. It was a pleasure meeting her. What a beautiful smile it is. And after reading this, I see it comes straight from a beautiful heart. Wow, Lydia is awesome! And an incredible inspiration to find and act on meaning in one's life. Thanks for sharing this lovely story. I cannot wait to meet Lydia. Jonathan, Patricia and Lydia will be my house guests for a few days before Oshkosh... YEA ME!! What an amazing story. What a brave little girl! Lydia K, she is a brave little girl. Thank you!!! What an incredibly brave girl with a beautiful smile! I wish her all the best. Hold on, Lydia! WISH HER SUPER BEST FROM ALL MY HEART. Thanks Dipeet. She's a fighter and going to do great! All the best !!! My good wishes for your success !!! May all your dreams come true !!! Her dreams will come true!!! Lydia's story is touching. Coming from Africa myself, having had almost similar story in life as Lydia, going through PPL with great difficult, Lydia again has lifted my heart and urges me to move on. Thanks Karleen for sharing. Elias Toroitich, Kenya. wow thank you miss karlene for sharing this with all of us and keep pursing your dream Lydia this is my message to you and we all pray for to become a succesful avationist ..
Ifran, Thank you so much for you wonderful comment! Your words mean so much! ma'am i really appericate your work and the best thing i noticed that your doing with full dedication and this story is really motivational for us i thank you from the deep of my heart.